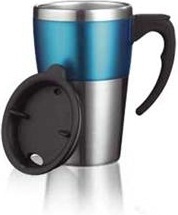 Keep customers rolling in with this fashionable and stylish Highlands Mug for Business Gift. Stainless Steel with a capacity of 340 ml, ensure long term exposure of your company brand name for many years over. keep your drinks warm for nearly 2 hours! Perfect for large drinks of hot chocolate on those cold winter mornings! Personalise your prefered custom logo or image and ensure total exposure. Beautiful promotional gift ideal for handing out at trade shows of conferences as a business gift or freebie - make sure your company is noticed!! 1 Colour Logo. Packed in a white box. For a FREE QUOTE please fill in our contact form regarding our Highlands Mug for Business Gift and we'll be able to help you.